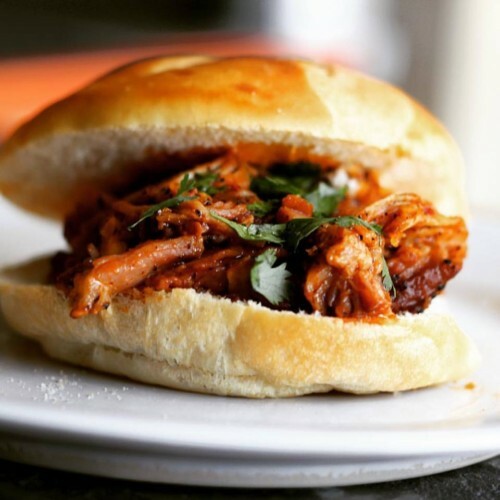 Blueberry Chipotle & Tequila Pulled Chicken | Get In The Kitchen | Cooking. While. Awesome. 1-2 tbsp Chipotle Salsa Can find this in the Mexican food aisle in a can- this is spicy sh!t so taste it first to see how much you can handle. In a bowl combine the 1/4 cup tequila, Mexican Blend or substitute spices, Lime juice or vinegar, olive oil, chipotle salsa, pineapple and mix thoroughly. Add the chicken and the dried chile and coat thoroughly with marinade for at least an hour. (Would be perfect to marinate the night before and have it ready after a long day of work). In a large, deep pot, sauté the garlic cloves (whole or sliced) in about 2 tbsp olive oil over medium high heat for about 1 minute. Add the blueberries and sauté for an additional minute or two. Place the chicken in the pan and let brown for about 2 minutes, and then flip and let brown for an additional 2 minutes on each side. Save marinade for next step. Add the marinade, and 3/4 cup each tequila and add a pinch of salt and tbsp butter. Let the liquid come to a simmer. Turn heat to low and cover. Let simmer for 3 hours. Using two forks, shred the chicken. Serve on bread of your choice.